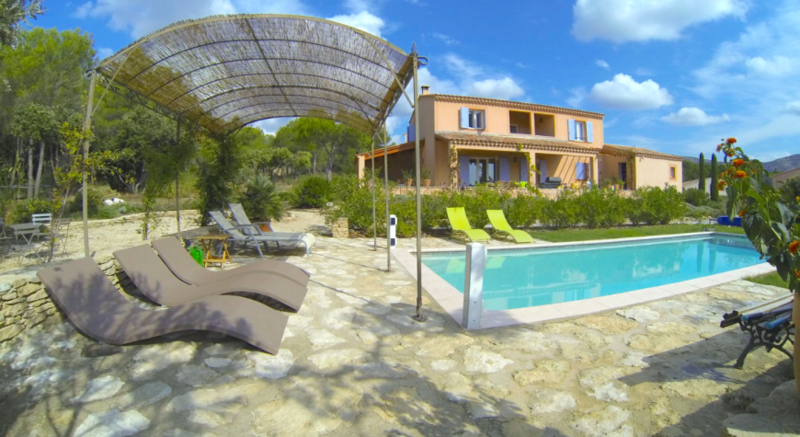 The villa is located in one of the most beautiful places of the domain Les Demeures du Luc. In a beautiful private garden of 6000m2 full of lavender, oleanders, olives, grapes and of course provencale herbs. The garden has a number of terraces with fantastic panoramic views over the Vaucluse, Luberon and the Alpilles. In the middle of the garden, between the grapes and oleanders, you can find a private swimming pool. Directly from the garden, the beautiful bike and hiking trails start right through the Monts de Vaucluse. The villa is a great starting point to climb Mt Ventoux by bike. On the domaine there is a reception with Dutch administrators, also a general (large) swimming pool with paddling pool, a tennis court and a jeu de boules court. In the morning there is fresh bread at the reception (May-Sept). Near the domaine runs the river Sorgue, a river with nice rapids and waterfalls and here you can canoe. An 18 hole golf course (Provence Golf Club) is located at 5 minutes. The provence offers a beautiful nature, a wonderful climate and an interesting environment. Both nature and culture lovers will get their money's worth. Close to the park you can board the canoe to make a nice river trip. The famous and tourist towns of Fontaine de Vaucluse (famous for its impressive source) and Isle sur la Sorgue (known for its many antique and flea shops and markets), also called the Venice of Provence, are within a few minutes by car accessible. Avignon with its famous Palais du Pape, Pont d'Avignon and cozy old town is a half hour away. Many other famous places and sights are in this area. There is also a local market to visit every day. The villa is approx. 200m2 and the garden 6000m2. On the ground floor there is the spacious living room (approx 45m2) with flat screen TV (104cm full HD) with Dutch channels, some International channels and a DVD player, Radio with CD player, separate kitchen in Provencal style, a separate toilet and a double bedroom with private shower and sink. On the 1st floor there are three double bedrooms, a large bathroom with bath and shower and a separate toilet and a beautiful covered terrace with really fabulous views of the surrounding area. The kitchen is provided with oven and dishwasher. Outside: On the terraces outside there is the lounge furniture and a large teak dining table where you can dine perfectly, possibly with guests in a Provencal atmosphere. Directly in front of the villa is the large private swimming pool (10 x 4) with loungers and shaded areas. At the pool you have 100% privacy and yet a beautiful view over the surroundings. The swimming pool is also equipped with a heat cover so that the water in the spring and autumn is well on temperature. In the large garage there is the washing machine with an extra fridge.